Check out the 260W solar panel. Helaine Wilesmith putting her 1974 Haines project boat to good use. Helaine’s Amity (right) certainly cuts the mustard alongside more late-model offerings. This 1974 Haines Hunter 213C project boat languished in a driveway for two years before it was reborn as an offshore boat. 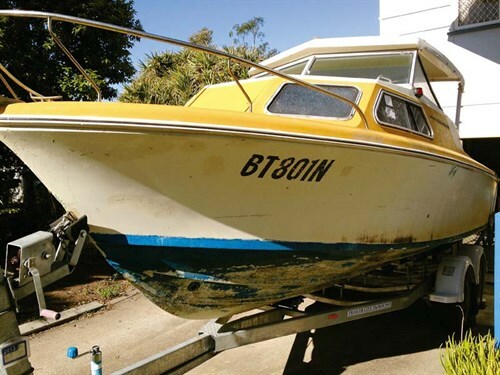 For this 1974 Haines Hunter 213C project boat, the first two of its three years were spent sitting in the driveway. 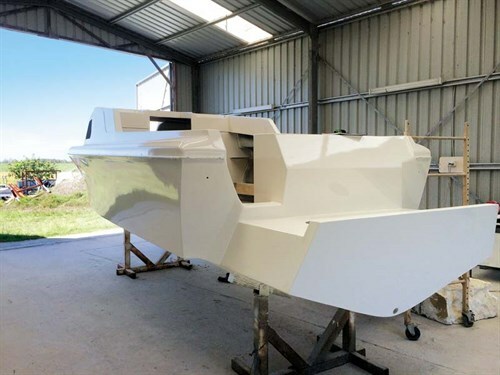 The story of this Haines Hunter 213C project boat restoration begins – like so many do – with dreams of a bigger boat for offshore missions and overnighting at sea. Helaine Wilesmith was thinking just that when she sold her old Cruise Craft Spirit in search for a bigger offshore rig. Deciding a Haines Hunter 213C would fit the bill, she dutifully stalked the internet before eventually sourcing a Haines Hunter 213C factory hardtop in NSW. After a bit of mucking around and a few long drives, Helaine’s prize was soon sitting in her Brisbane driveway. Where it promptly stayed for two more years. Finally it was time for the refit, but a number of boatbuilders wanted no part in this project. "I think I went to four or five boatbuilders who all just looked at me as if I was a crazy lady and said, ‘Just sell her love, and buy something on the water’," Helaine told us. "Clearly these guys were not getting the job. I was looking for someone who had just as much passion for this old girl as I did." "Her nickname was Colonel Mustard," Helaine said. "Or the ugliest garden gnome in the street." That person was Adam Milner at Woolloongabba, who quizzed Helaine’s project for three hours before she hired him on the spot. "The process of rebuild was a longer and more twisted road than I had anticipated," Helaine said. "I hadn’t anticipated that I’d be changing and adding as we went along, but the finished result is everything I wanted. "I was originally just going to rebuild the stringers, floor, bulkheads and transom and then respray her. But I ended up doing that and much, much more." 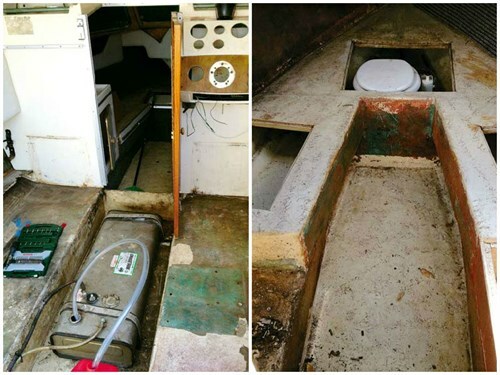 After the transom was rebuilt, a pod suddenly seemed a good idea as there was no room left for a baitboard, livebait tank or batteries. So Adam remodelled a whole new transom complete with custom-made pod. How about a pod for the transom? That’s a helluva pod! The floor was foam-filled for buoyancy and the team slotted in the biggest fuel tank they could fit along the centreline – a 260lt fuel tank. A void between the Haines Hunter 213C’s vee-berth was filled with a fully insulated icebox, to supplement the one under the skipper’s seat and a fridge/freezer lives under the passenger. A big 260lt fuel tank was fitted on the cockpit centreline. A fully insulated icebox went into the void between the vee-berth. "On the hardtop I have added a 260W solar panel and have a CTEK battery management system to keep the dual batteries topped up," Helaine said. 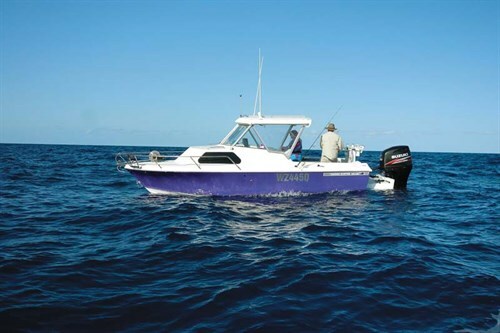 "I also added Volvo Penta trim tabs to the pod to help the ride – if that was even possible – and I went with a Lowrance HDS-12 MFD and a Furuno 585 sounder, plus a 1kW through-hull transducer." "Colonel Mustard" also underwent a colour change, resplendent now in white and purple (or blueberry as the paint tin says), although her official name remained Amity, and that is how the boat is now known. Along the way, Helaine even discovered her boat’s ‘birthday’ written underneath the deckhead – December 20, 1974. "From start to finish it took about three years," Helaine told us. "But two of those were sitting in the driveway! 1974 Haines Hunter 2013C, now fully restored and ready to go fishing. "All up, the rebuild cost around $50,000, and then I repowered her with a Suzuki 225 outboard motor. "Now I have a new offshore fishing boat that cost about half as much as going out and buying a new 685 Cruise Craft, and she’s all custom-built to my own specs." 1. Expect the actual spend to be double your budget. 2. Find a project boat partner who is as passionate about it as you are. 3. Go out on as many boats as you can and see what works and what doesn’t. 4. Be open to suggestions: others can have better/cheaper ideas and things you haven’t thought of. 5. Be prepared for setbacks and problems. It’s a journey, enjoy it. 6. Stick with it. Once finished there is no greater feeling of accomplishment and pride. See the full version of this story in Trade-A-Boat #466, June / July 2015. Why not subscribe today?